Google Analytics reports nearly 4000 visitors daily. Hoagies' Gifted Education Page was born on March 17, 1998. After modest beginnings, our visitors grew geometrically, passing 1,000,000 visitors just after our 9th anniversary in April, 2005... Since then, over 8 million visitors have graced our doors. Thanks for making us popular! We encourage you to share Hoagies' Gifted Education Page with other parents, educators, anyone who might benefit from a collection of information about educating gifted children. When printing materials found on or linked to from our site, please respect the copyright of the author. No pages may be reproduced for sale without the explicit permission of all copyright holders. Feel free to link to Hoagies' Gifted Education Page at www.hoagiesgifted.org. Please use the page name "Hoagies' Gifted Education Page", and send us a notice of the page the link is on - we're always on the lookout for great new resources for and about our gifted children. And if you're like us, and you love numbers and charts, Google tells us our visitors are coming to Hoagies' Page from by continent (all 6 inhabited, and as far south as the Cook Islands) or country (now 182 different countries! ), how they are getting here by search engine (Google, mostly) or referral, when they are coming by month, day, and hour, and what their systems are like... tons of neat information! 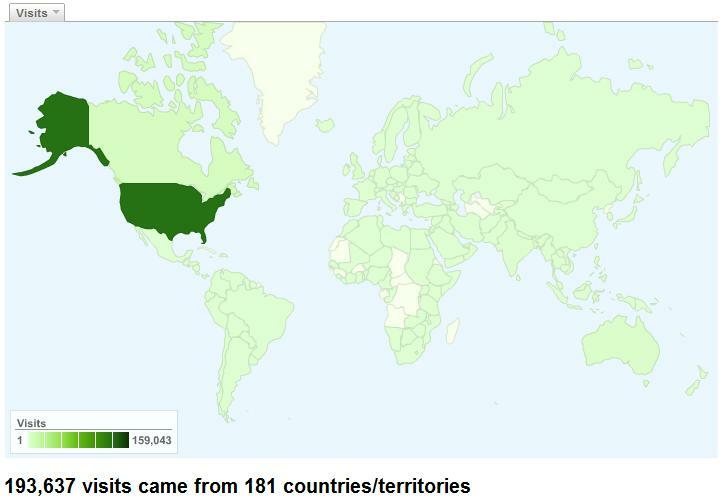 And for an amazing look at where Hoagies' Gifted Education Page visitors come from - all over the world! Nearly 90% of our visitors come from the U.S. with Australia, Canada, U.K. and New Zealand rounding out the top 5 visitor locations. We have visitors from nearly everywhere - we've made locating our visitors' counties of origin into a world geography study! Can you locate Saint Kitts and Nevis, Bosnia and Herzegovina, Lesotho, Tajikistan, or Rwanda? Thanks for visiting us. Hoagies' Gifted Education Page is for you, parents, educators and supporters of gifted children and their education. If there's something missing from or incorrect on our site, or something we ought to add, please send comments to Carolyn K. at webmaster@hoagiesgifted.org. For more about Carolyn K., read Who Am I?